The 4th/7th Royal Dragoon Guards was a cavalry regiment of the British Army from 1922 to 1992. It was formed in India in 1922 by the amalgamation of the 4th Royal Irish Dragoon Guards and 7th Dragoon Guards (Princess Royal’s), as the 4th/7th Dragoon Guards; it gained the distinction Royal in 1935. It returned to the UK in 1929, mechanised in 1938, and transferred to the Royal Armoured Corps in 1939 prior to the outbreak of war. In 1939, it deployed to France with the British Expeditionary Force, as the reconnaissance regiment of the 2nd Infantry Division under I Corps. It participated in the Battle of France, fighting in northern France and Belgium, and evacuated from Dunkirk in Operation Dynamo. The personnel of the regiment landed in England on 3 June 1940, having abandoned their vehicles. After re-equipping with Beaverette armoured cars, the regiment was posted to 1st Armoured Reconnaissance Brigade, and then in December 1940 to 27th Armoured Brigade, part of 9th Armoured Division, equipped with Covenanter tanks. At this time, a small group of personnel was detached to form the cadre of a new regiment, the 22nd Dragoons. In 1943 they joined 79th Armoured Division, equipping with amphibious Valentine tanks, and later re-equipping with M4 Sherman DD tanks. Under the 8th Armoured Brigade, the regiment landed on King Green, Gold Beach, at 0720 on 6th June 1944 as part of the Operation Overlord landings, supporting the 50th (Northumbrian) Infantry Division. The regiment later participated in the battle for the Falaise pocket, and as part of the armoured forces in Operation Market Garden - the regiment pushing as far as Driel, on the south bank of the Rhine a couple of miles from Arnhem. Among other notable achievements, it was the first armoured unit to cross the Seine. The regiment ended the war in Bremerhaven, and a year later was deployed to Palestine for a tour of duty lasting from 1946-1948. The regiment was then deployed to Libya, rotated back to England in 1952, and then to Germany in 1954 as part of 7th Armoured Division. The regiment then rotated regularly between England and Germany, with two squadrons deployed to Aden in 1965 and a squadron to Cyprus in 1966 as part of the UN forces. There was also a two-year tour in Omagh in Northern Ireland, from 1966 to 1968, following which the regiment returned to rotation between the UK and Germany. 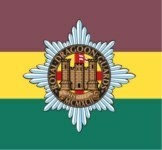 Following the reduction of forces at the end of the Cold War, the Options for Change proposal amalgamated the 4th/7th Royal Dragoon Guards with the 5th Royal Inniskilling Dragoon Guards, to form the new Royal Dragoon Guards regiment.